Bitcoin’s (Bitcoin) price is getting closer to the $4,000 mark today. 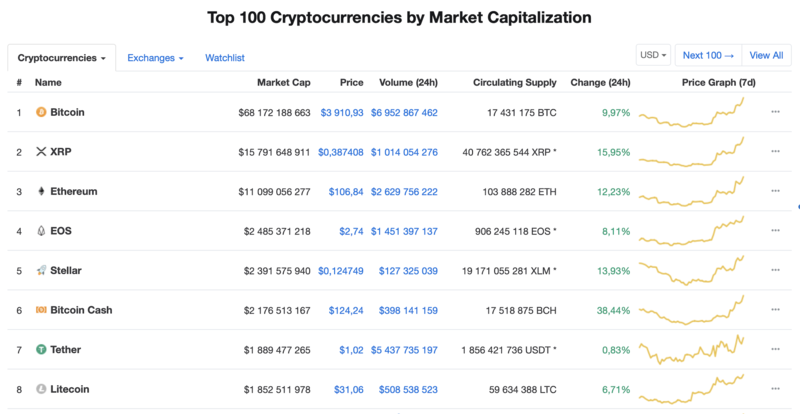 At 14h00 GMT the main cryptocurrency value surged to $3,910, recording almost 10 percent increase in the last 24 hours. Simultaneously, Ripple has risen more than 15 percent and Ethereum more than 12 percent for the same period. However, it is Bitcoin Cash the top 10 crypto registering the most significant price surge: almost 40 percent in 24 hours. Bitcoin (and other cryptos) most probably experienced this substantial increase in price thanks to severely oversold conditions: many cryptocurrencies initiated a corrective rally, pushing the entire market to climb in valuation.